While it is a bit more complicated than having an idea, the people at Mattel figured out a way to make it more understandable and fun for kids. 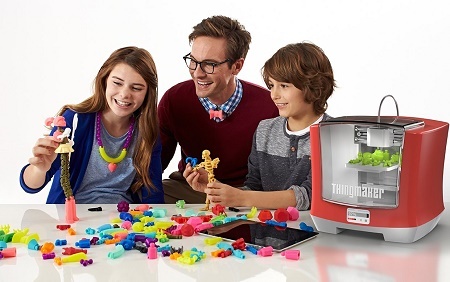 The ThingMaker 3D Printer will not only let kids print pre-designed toys, figures, and jewelry, but they’ll be able to make their own on a free app. They’ll be able to send in their designs straight from a tablet or web browser. Of course, while this machine is extruding hot plastic, hands should not be anywhere nearby, so this has a retracting print head to keep things nice and safe. Just for safety’s sake, there’s also an automated door lock so once things are started you have to stop them to get at anything inside. This is a $299.99 purchase, and will likely come with some starter plastic, though you will undoubtedly have to get more. For those interested, this item will be released in mid-October of this year, a fine holiday gift for aspiring makers next December.